We left Omsk for Kurgan this morning and whilst heading out of the city we came across an accident which must have happened only half hour or so before hand. Looked like a car had pulled out of a side turning straight in front of a speeding van, the side of the car was cut out but the driver left dead in the seat uncovered whilst the emergency services hosed the road around the car. This was a bad start to the day and quite upsetting to say the least. 2 or 3 miles after this we were pulled up by the police to see our papers and wanting to have us for speeding but after half hour of smiling and saying ya ne ponimayu (I don’t understand) he let us go. About an hour down the road I was riding behind a couple of cars, as I started to accelerate to overtake at about 70mph ish a car in front of the line decided to stop all of a sudden without reason warning or brake lights! the row of cars slammed on their brakes, I grabbed a handful of brake and started snaking down the road coming dangerously close to the lorries going in the other direction. I managed to scrub most of the speed off before the back came out and high sided me right on the white line, amazingly missing the cars and lorries in both directions. The bike came to rest in the middle of the road, one broken hand guard and a couple of bruises was all to show for the incident thankfully. Kev was following and said he thought my time was up and I was going to get squashed by a lorry, also mentioned that he was gutted he hadn’t had his head cam running!. 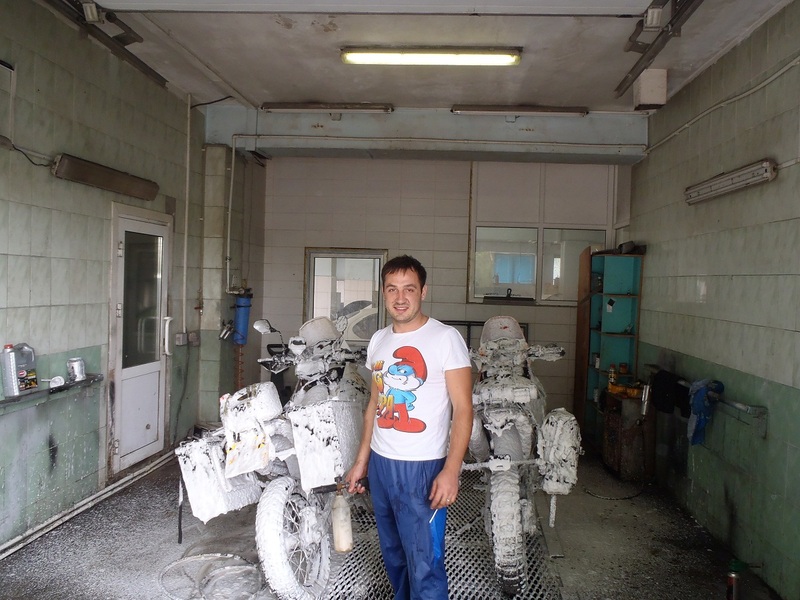 Shortly after this Kev had to strip his bike down for the third time to clean out the injector, it’s a bit of a pain as you have to take off the side panels, side tanks and airbox to get to it. This time we found a tube from the chain lube can which we hadn’t used so was able to shoot the cleaner right into the injector and blast any muck out instead of possibly just moving it about, after doing this twice previously we decided to leave the front airbox screws out so we could access the injector without a complete strip down should the problem occur again. so an hour on the side of the road and all sorted until the next time. Kev working on his bikes injector. Arrived in Kurgan early evening and after a quick ride around the city found a hotel called “Hotel Moscow” was reasonably priced and bikes were parked safely around the back. 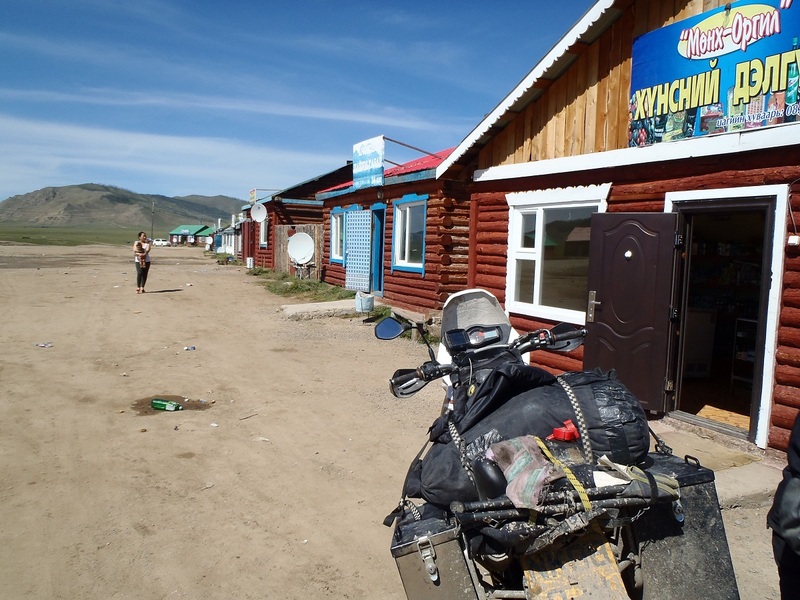 While having a well deserved beer we got talking to a couple of local’s that ride Urals, a few more beers and something to eat we decided to call it a night. 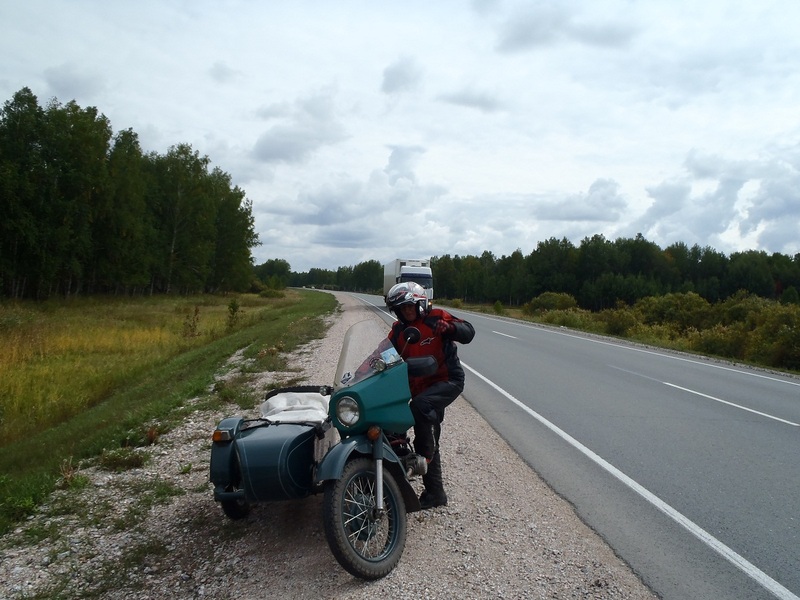 Novosibirsk to Omsk today just over 600km which is why we didn’t leave yesterday afternoon once Anton had done the injector and bike clean. 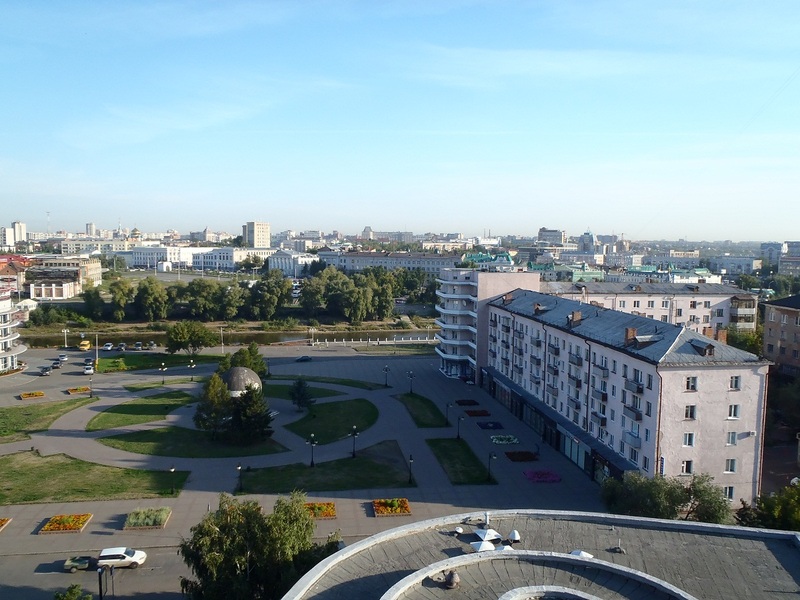 It would have been to late to arrive in Omsk, find accommodation and avoid the potholes in the dark. 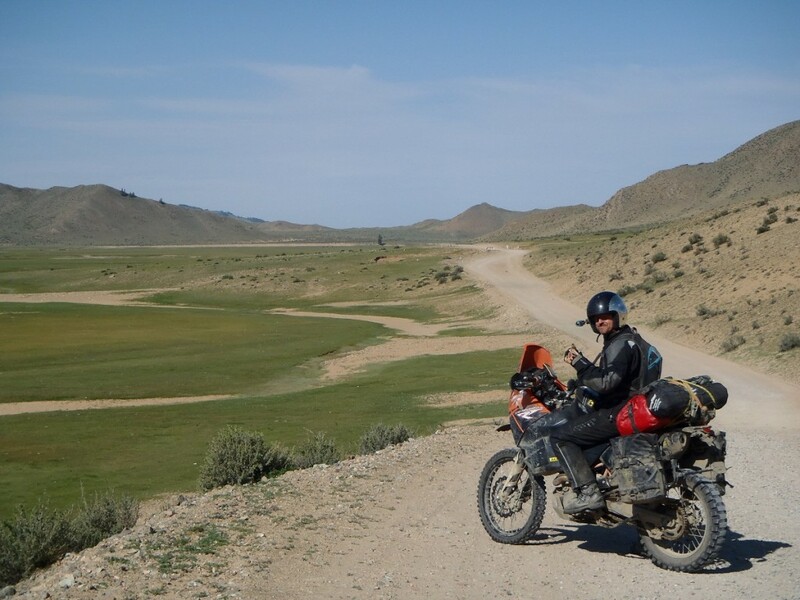 About 100/120km out and Kev’s bike started to play up again so we had to strip it down at the side of the road to get the injector out and try clear the blockage, luckily Anton gave us a can of carb cleaner which came in very handy. 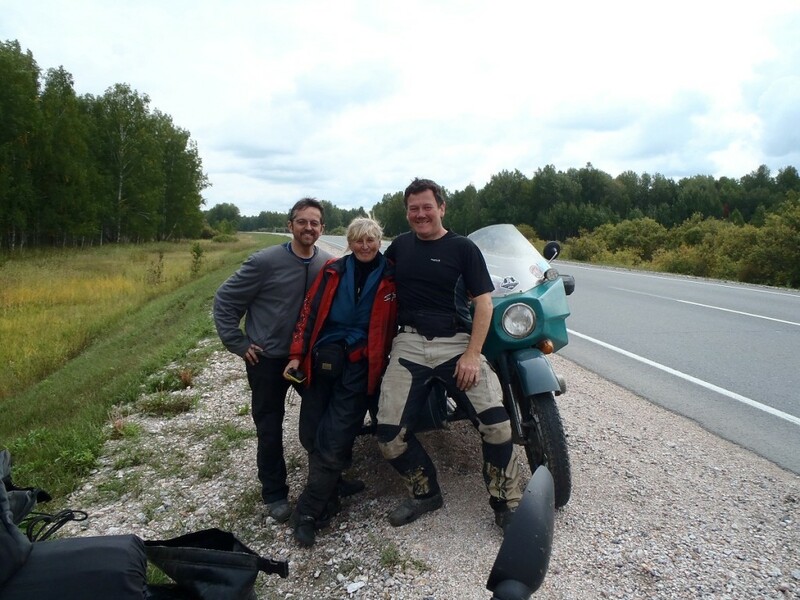 As we were working on the bike and old Ural complete with sidecar pulled up and off got a lady well into her 60’s to see if she could help us, she introduces herself as Natalayia or Nata for short but in her Russian accent it sounded like Nutter! First thing Natta did was give us tea from her flask and then phone numbers and email addresses of people we could stay with and who might be able to help. After half an hour or so Nata left narrowly missing my bike with her side car standing on the pegs and waving, living up to her name!. We headed off about 15 mins after Nata and soon passed her with her arm out waving frantically and a big smile on her face. About another hour down the road we stopped for a bit of lunch in a road side café of which there are many in this part of the world. After lunch as we were getting on our bikes Nata came past (hare and tortoise came to mind) with her camera in her hand filming us and then stopped for another “chat” then we all headed off together leaving Nata behind us doing only 70kph. Another hour down the road and the injector was again blocked so another strip down was necessary, yes you guessed it along came Nata and stopped for another chat whilst Kev worked on his bike. 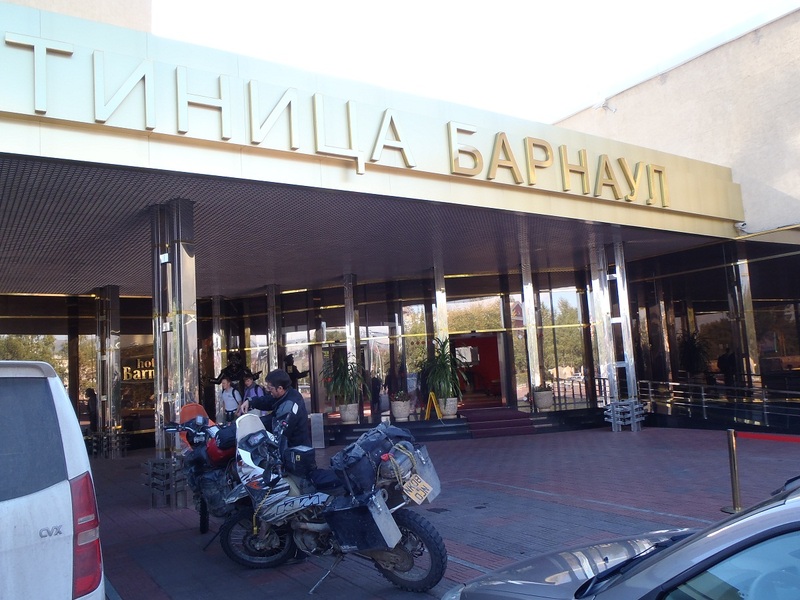 Eventually we arrived in Omsk, rode through the city centre and found a hotel from the waypoints on my Garmin. 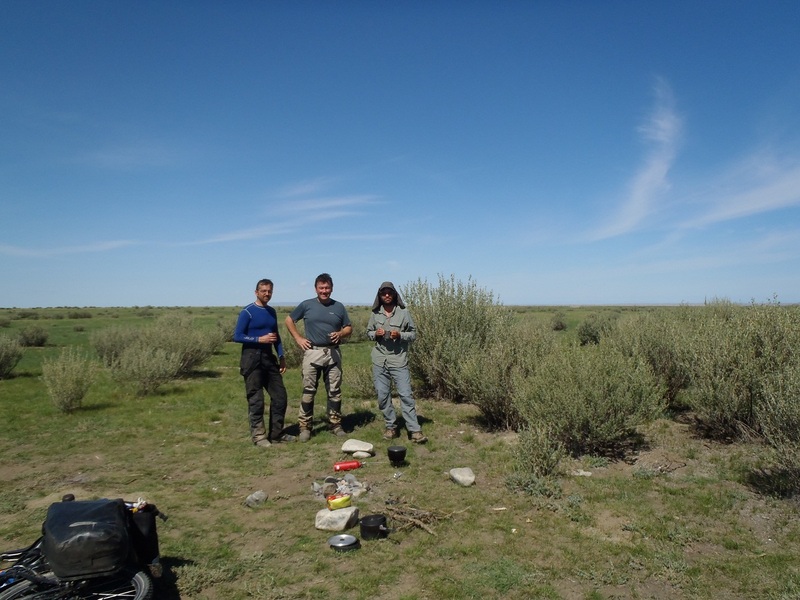 Woke this morning with a very sore head due to far to much vodka!, Yuri and his sister in law prepared us some breakfast whilst we waited for Anton to pick us up. We got to the garage and Anton set about stripping Kev’s bike down to the injection unit so as to flush it out. 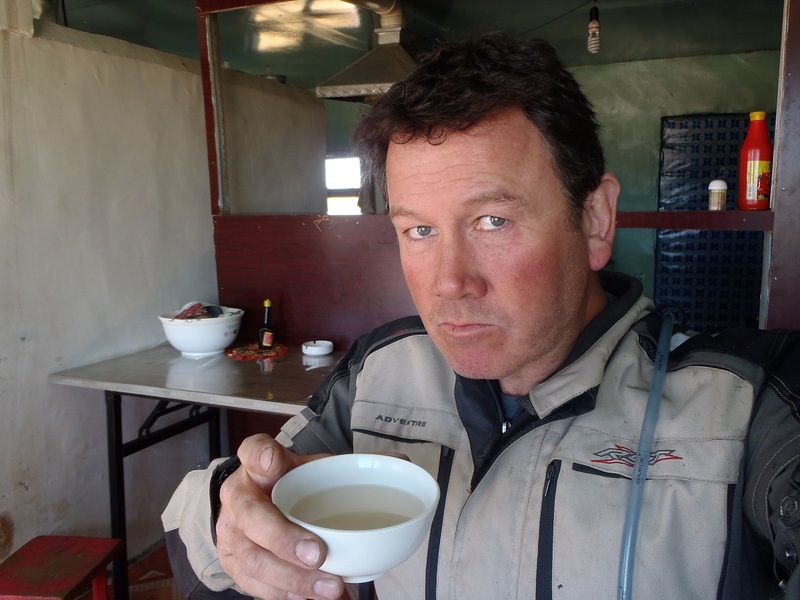 Tanya made us coffee and I helped trying to source a rear tyre and some mirrors for my bike. By midday Kev’s bike was up and running without any misfires, so Anton gave each bike a clean (great chap didn’t speak much and looked a bit like Tom Hardy). Tanya could only source a 120-80-18 rear for my bike so took it but will only put it on when the part worn is knackered. 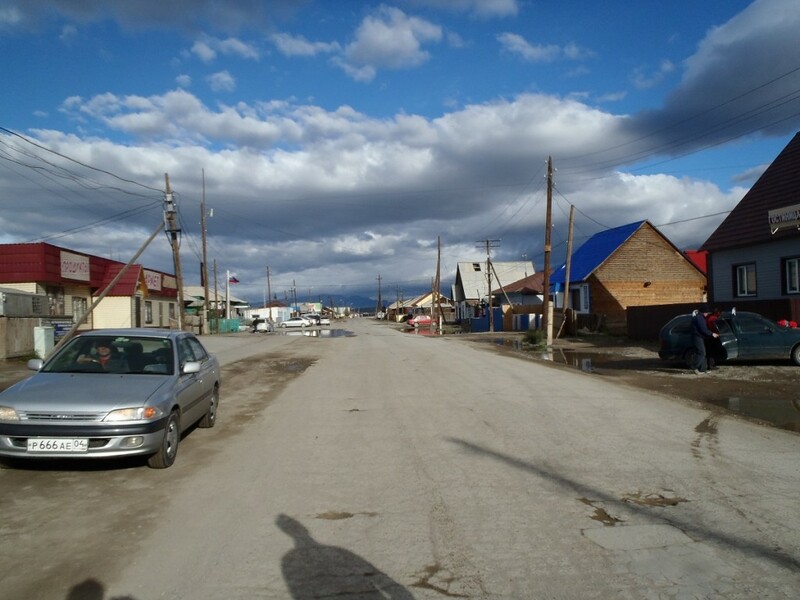 We needed food and needed money to pay for the rescue and the work so by the time all this was sorted it was about 3 o’clock, to late to get moving to Omsk so decided to stay in the city for another night and leave in the morning. 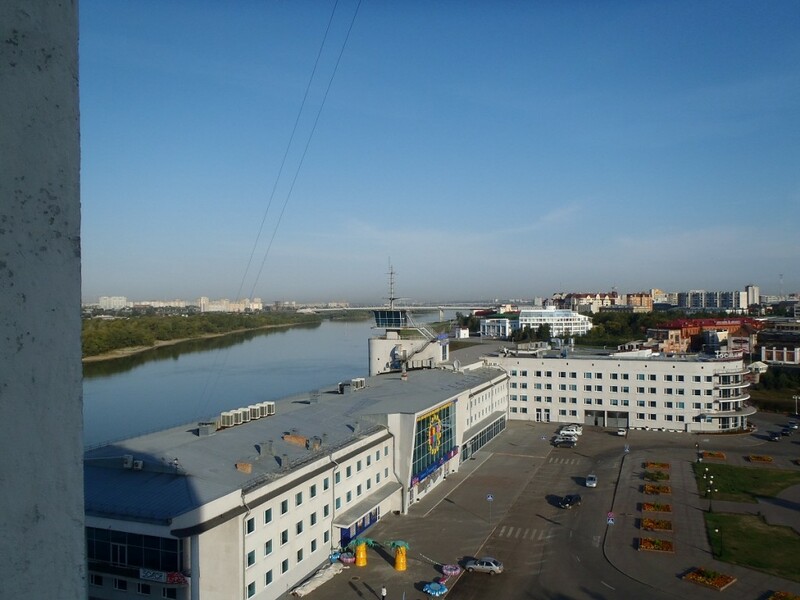 We found a decent Azimut hotel right in the centre, Kev was tired (don’t know why as he hadn’t done anything all day and didn’t even ride his bike all the way to Novosibirsk 🙂 ) so i went for a walk around the centre. It’s a big place and even has a metro, found an Irish bar had a quick beer and retired to the hotel for the night. Yuri and his sister in-law. 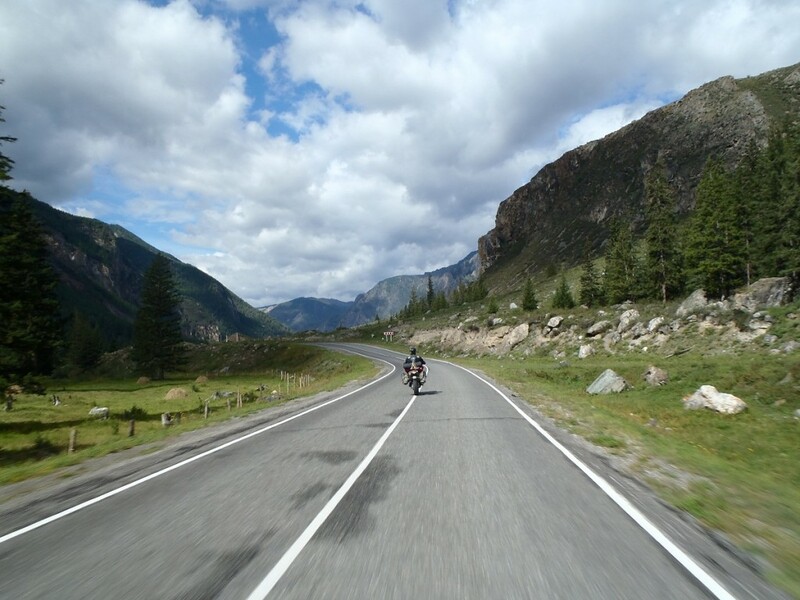 Today we left Barnaul feeling a bit hungover heading for Novosibirsk about 300km away, the road between the 2 city’s is pretty boring long and straight with very little to see apart from trees, it’s a tough on an endure bike with a terrible saddle. 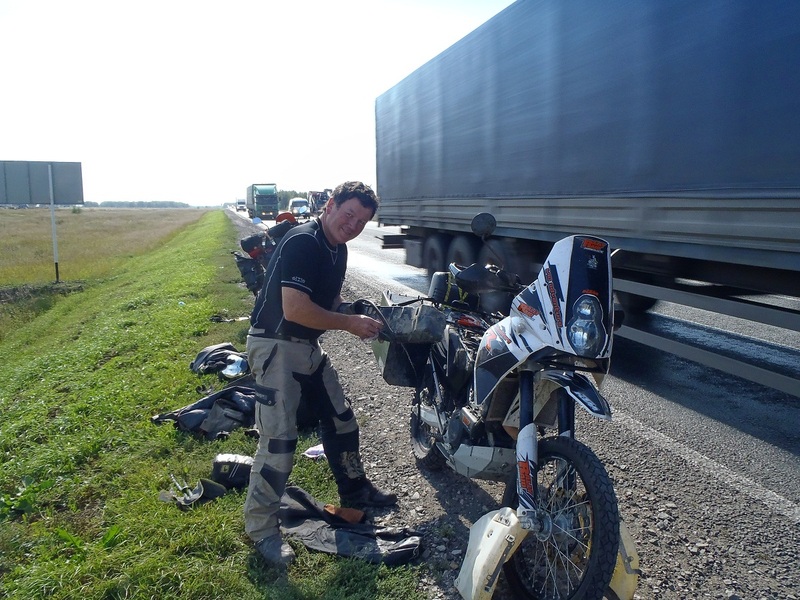 About an hour from Novosibirsk Kev’s bike started missing and back firing and generally losing power until it came to a complete stop, we changed the fuel filter inside the rear tank which was in a bad way, it was black and thick sludge dripped out of it when it was removed. Hoping this was the problem we put his bike back together and attempted to fire it up, no change 🙁 it was still farting and stalling. 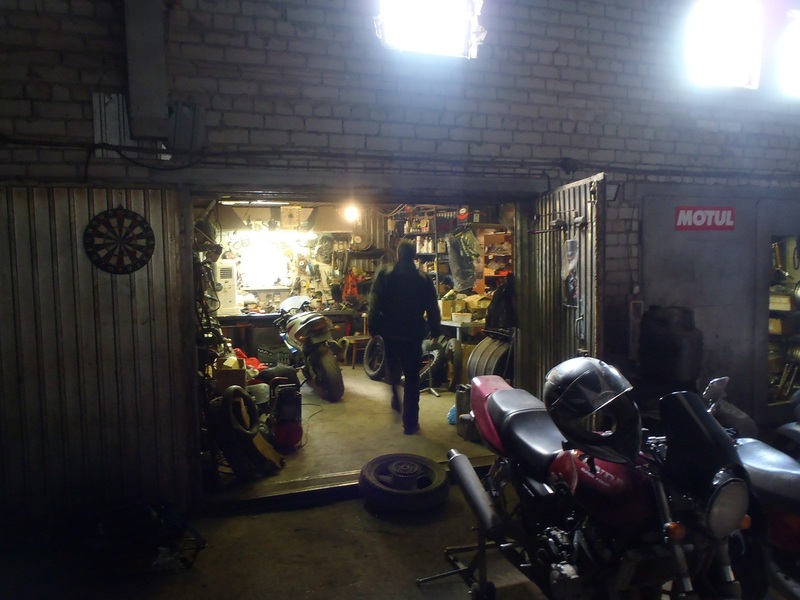 Whilst working on the bike a lorry driver pulled up who was also a biker and although he was working spent an hour and half with us sorted out a recovery truck and garage before he left, yet another great helpful Russian he also knew the barman at the Barnaul bikers club we spent all night in. 2 hours later Anton pulled up in his Lexus jeep with trailer to collect us and it took a further 1.5 hours to get back to his garage where we met Tanya one of Anton’s co-workers. 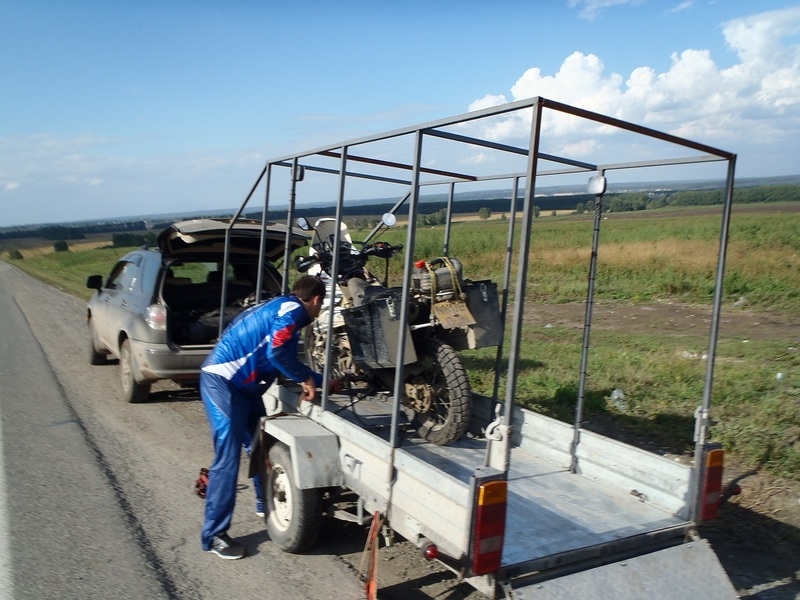 Kev’s bike on the trailer to Novosibirsk. Tanya gave us coffee and our own office while she arranged for us to stay with one of her friends Yuri, then Anton drove us all to Yuri’s flat and on the way picked up Tanya’s friend who spoke very good English. 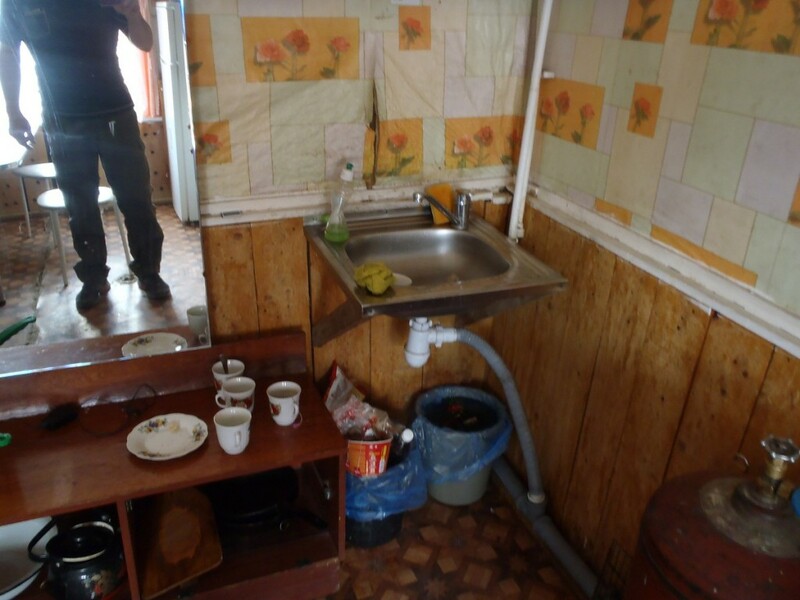 We arrived at Yuri’s, had a shower while the girls went to the shop to buy food to make us a lovely meal and the 6 of us sat eating and drinking vodka till the small hours. It was a great night with genuine, generous, nice people but we are going to pay for it tomorrow with our sore heads again! This morning we called André who came to our hotel to give us some information on tyres and where Victor was located, we repaid him with for his help was a coffee but he had to leave due to other appointments. We then headed for Victor’s garage to see about mirrors, tyres and 2 left hand rear indicators of which mine only lasted 10miles out the road! Victor is a very nice chap (cheap to) and anyone passing this way should give him a visit if they need anything bike related. We didn’t get finished with Victor until around 5 and only managed 2 new front tyres, one new 150-60-18 rear for Kev, and a second hand 140-80-18 rear for me. Hopefully it will last until I manage to get a new one. 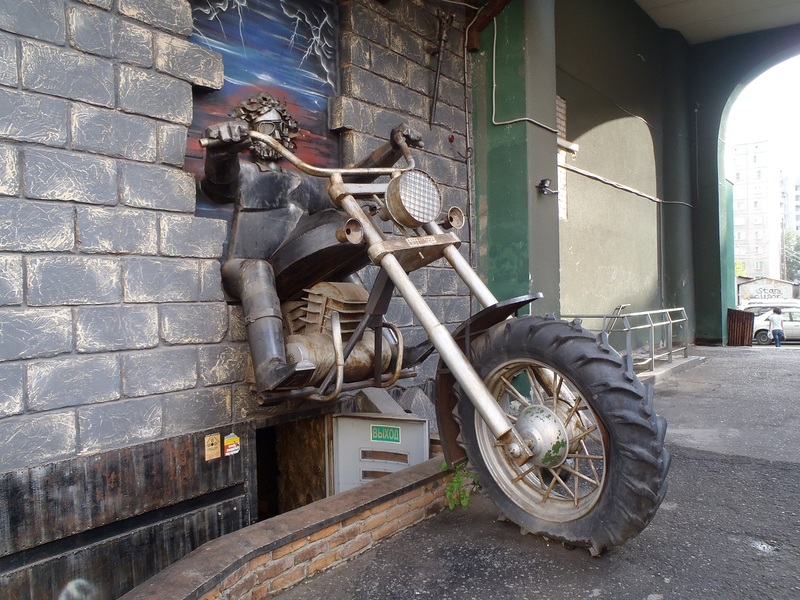 So another night in Barnaul but we found a biker bar where we sat until 4 am chatting to the locals, the first proper sore head this trip! Last night we stayed in the worst guest house ever, what a shite hole and it stank to hi heaven but we were cold and tired so needed somewhere warm to sleep which we did get. 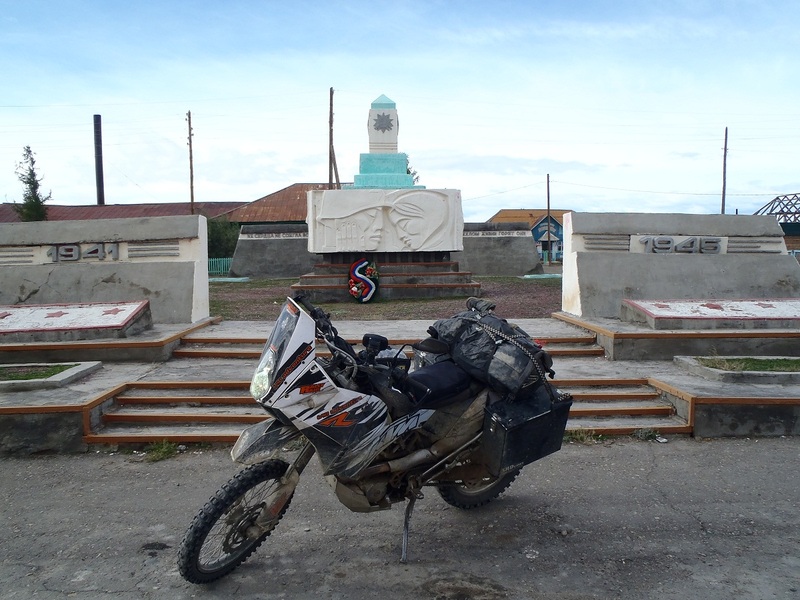 Kosh Agach great war memorial. 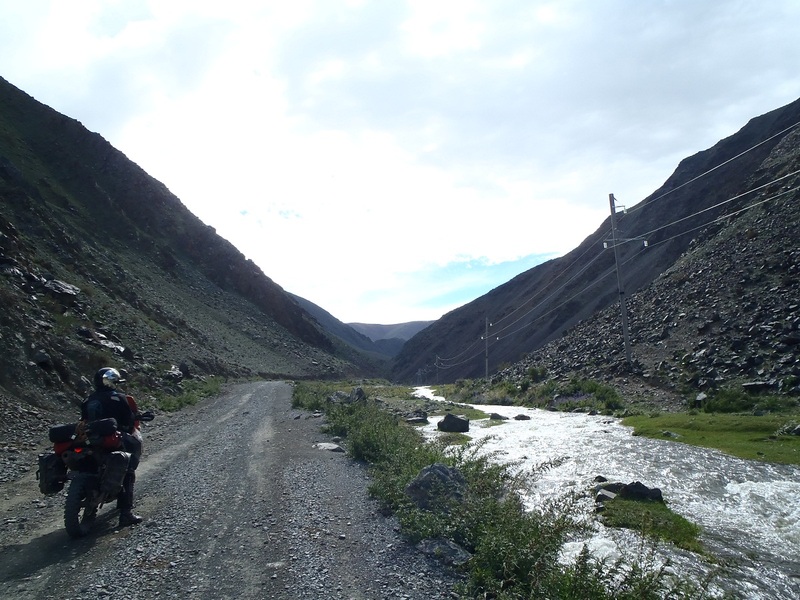 Left leaving Kosh Agach for Barnaul today on what turned out to be one of the most beautiful roads we have ever ridden, the M52 runs from the Mongolian boarder to Novosibirsk about 1000km of which the first 500 or so run through the Altay mountains following rivers with plenty of twist and turns its absolutely a bikers dream. 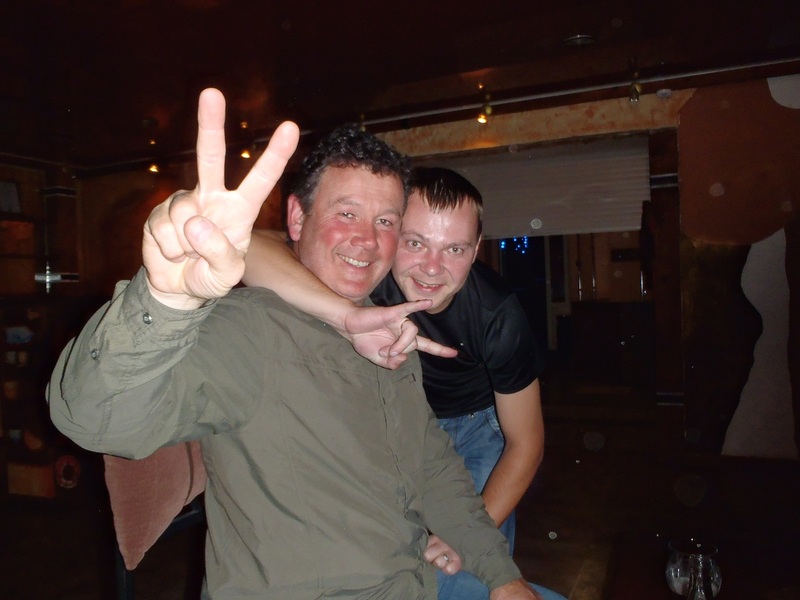 We arrived in Barnaul to late to contact André or Victor for tyres so had a couple of beers and an early night. 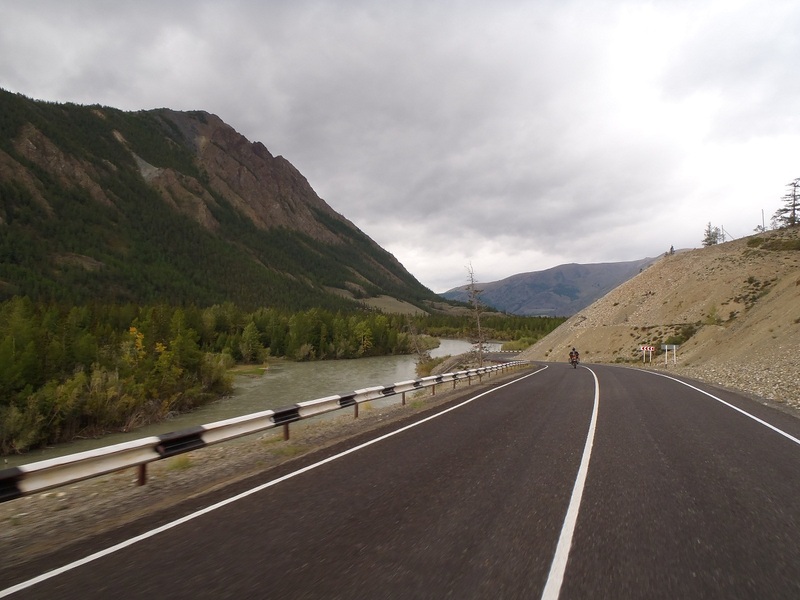 Today plan was to get as far past the Russian boarder as possible which was looking good until we came upon our second river crossing of the day and probably the last of the trip. The weather was starting to turn so Kev walked the river for a good hour to find a suitable place to cross but it had been raining up stream so the river was raging and getting higher. 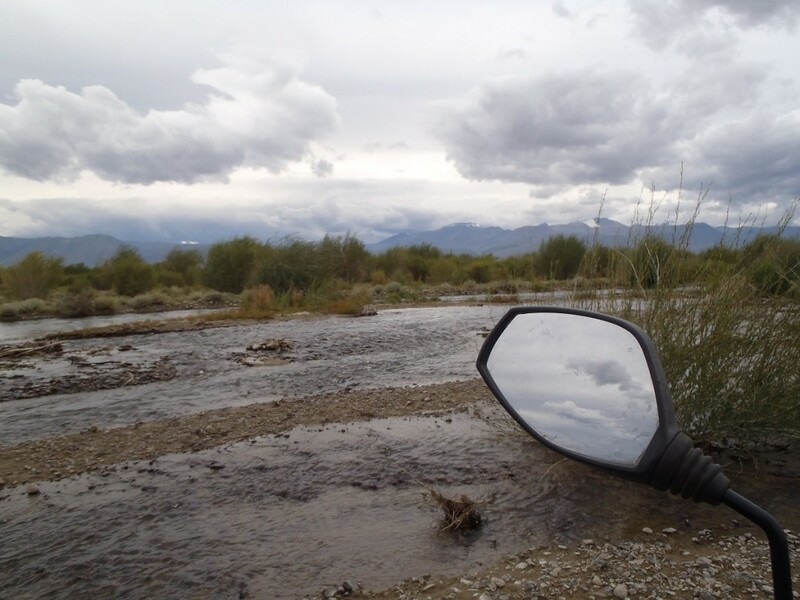 The other problem with the river was that it splits into 5 or 6 rivers so had to find the safest path through each, we were able to ride through a couple though the rocks were very slippery and the current very strong which caught me out. Once again I dropped the bike but recovered it quickly, my 690 r is just a little to high for me and it’s difficult to keep my balance on slippery surfaces if I hit a boulder. We got to a middle island and I looked around and noticed that I had lost my tent, a flip flop and my camping stool 🙁 , I had loosened off the straps whilst waiting for Kev earlier thinking we may have to carry the gear across. 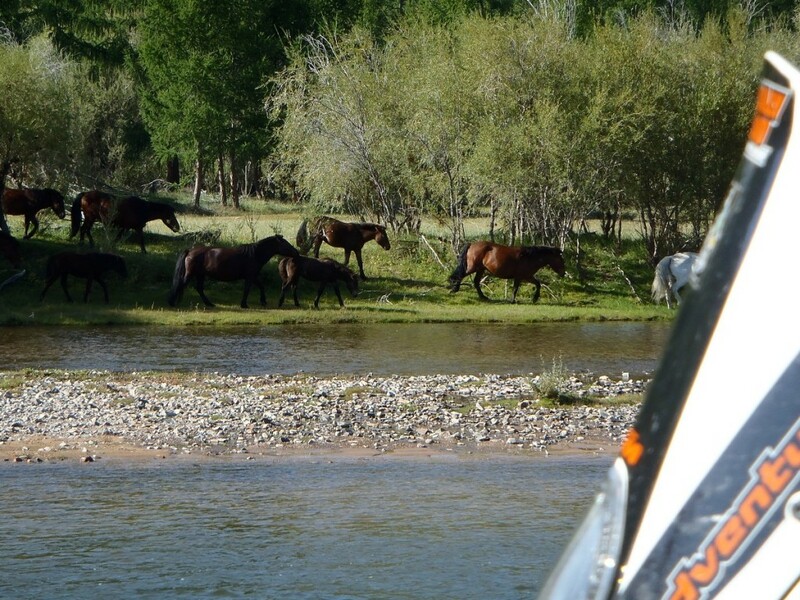 In the rush to get across before the river became to fast and high I had forgot to tighten the straps back up. On the way to Russian Border. 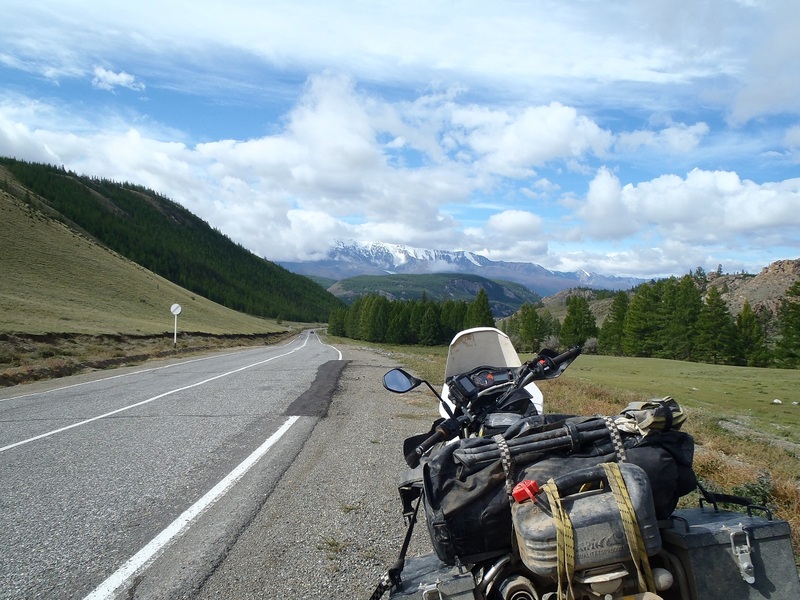 Mountain pass near Russian border. Camels near the Russian border. A couple of Mongolian horsemen arrived when we were half way across and offered ropes to pull us with their horses, these guys were really nice, they showed us a path through the rest of the river. 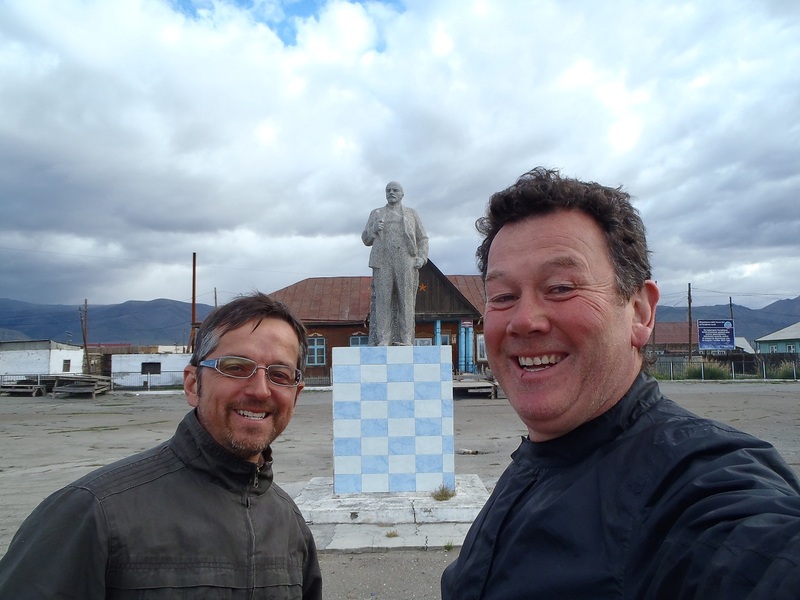 By this time the wind and rain had started to hit hard, so after a quick chat, photo session and direction to the border we went on our way. 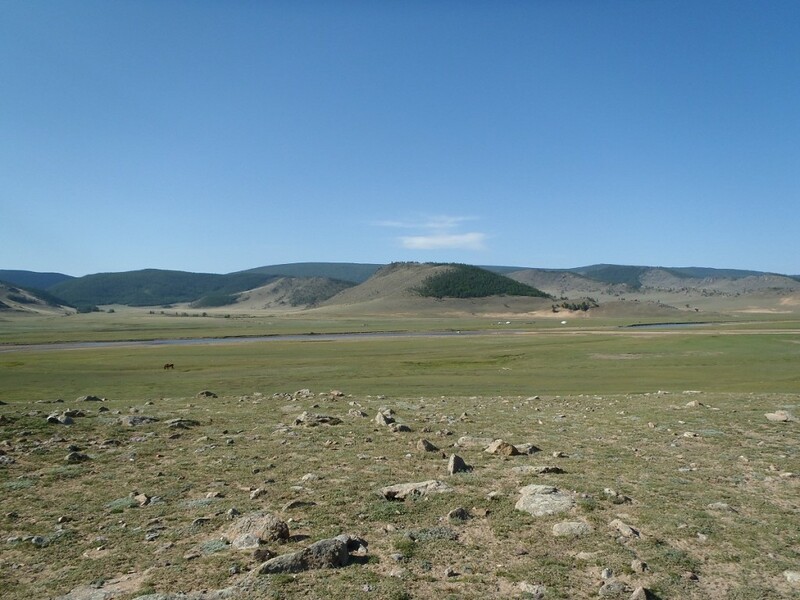 Mongolian river crossing near Russian border. 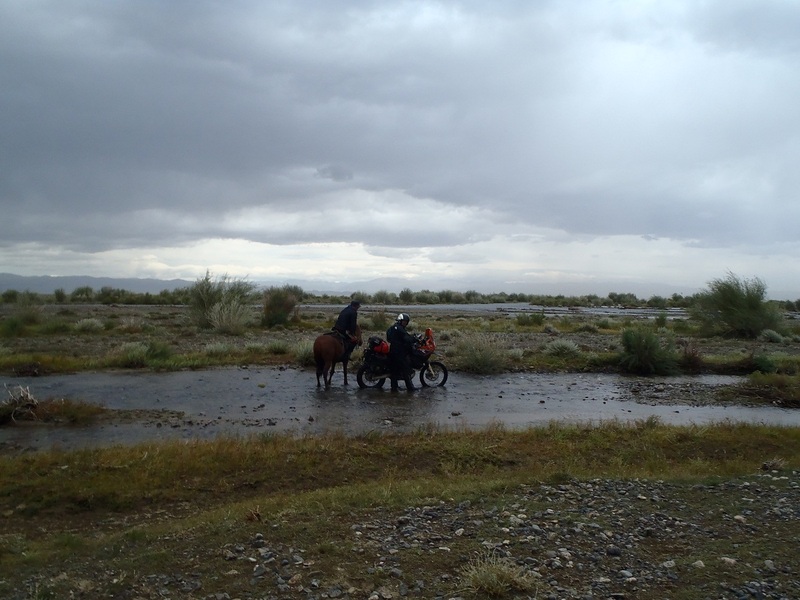 Mongolian river crossing with horseman. From the river we crossed an open plain, I have never experienced wind like we had there. At times I was leaving 45 degrees against it just to keep upright! 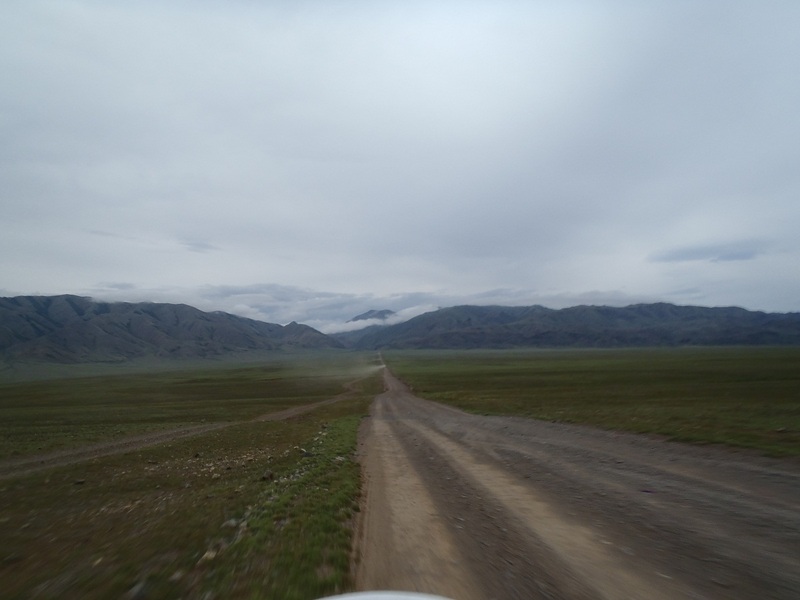 It was bitterly cold and hail on top of the fact that I was wet, we climbed higher into the mountains where the Mongolian frontier is located, the tracks disappear without warning so at times we criss crossed to find more tracks going in the right direction. 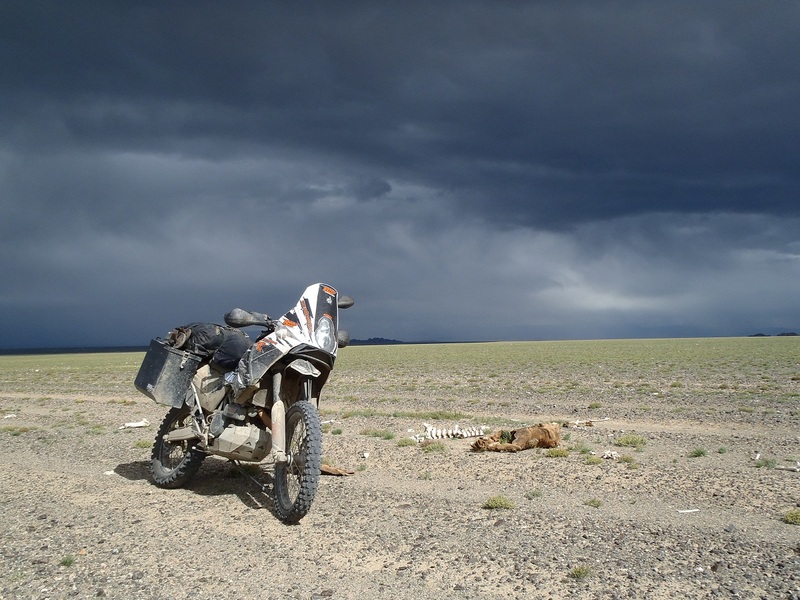 The last 100km or so is desolate with a few Ger’s scattered around and a small town 20km from the border but why it’s there I couldn’t hazard a guess. 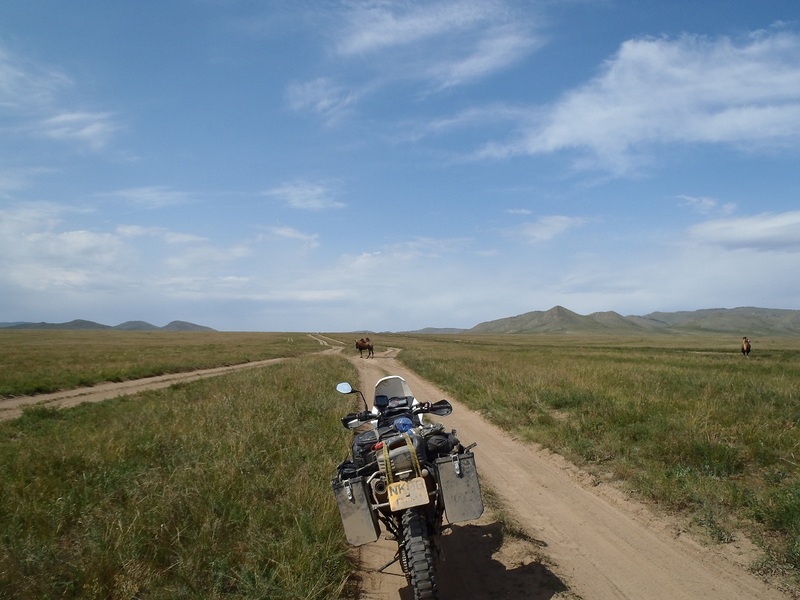 Riding along the road and suddenly the border fencing cut straight through it with no gate! 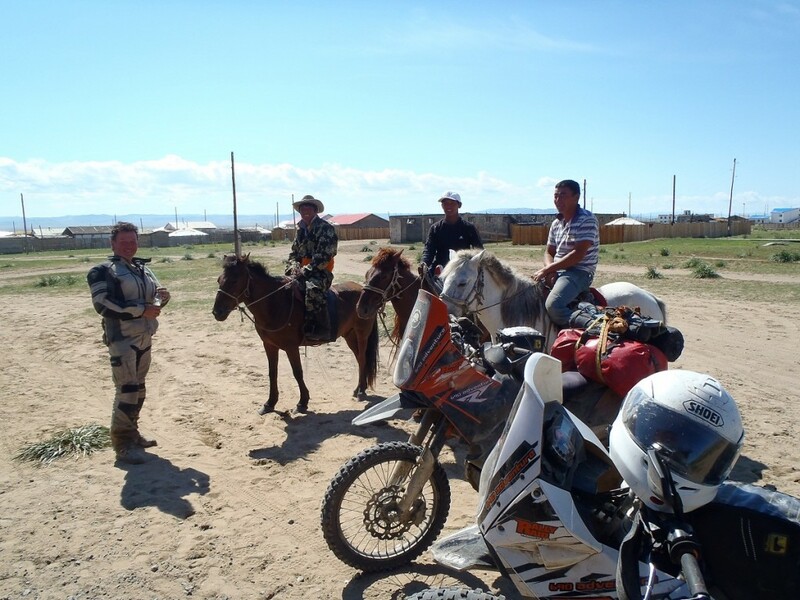 we stopped to check the GPS and a young lad pulled up on a motorbike telling us that the border is closed for the night and we could stay with him in his house, he also knew where we could change money, get food or drink, get bike bits or anything else he could possibly sell us. 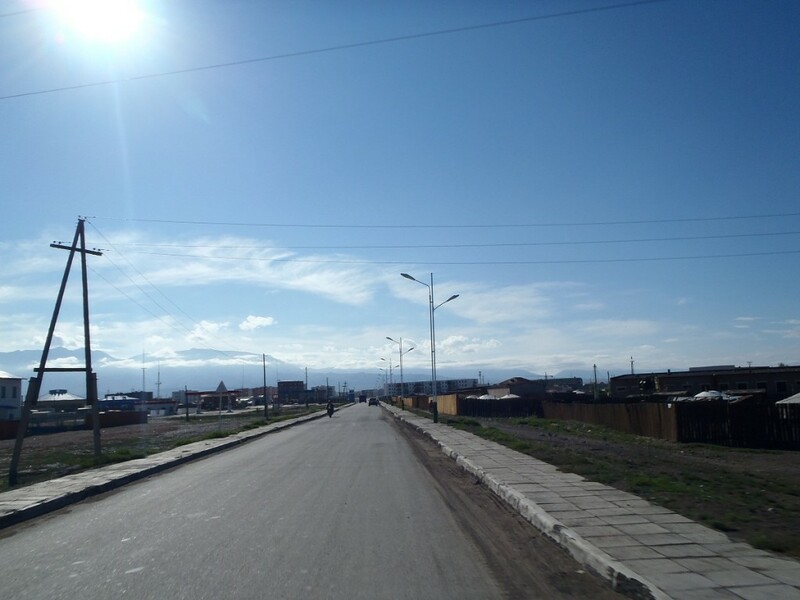 Time was getting on so we told him we would check the border and get back to him if there was a problem, we followed the line of the border fence past the town until we hit another road, a quick dash to the border and what do ya know, the border was open but only just. Mark emptying boots of water. Passed the worst of the weather. We arrived at the boarder at 5.15 only to find it closes at 5.30 on Saturday, we were the only travellers there and they were not to amused at us turning up at such a time. 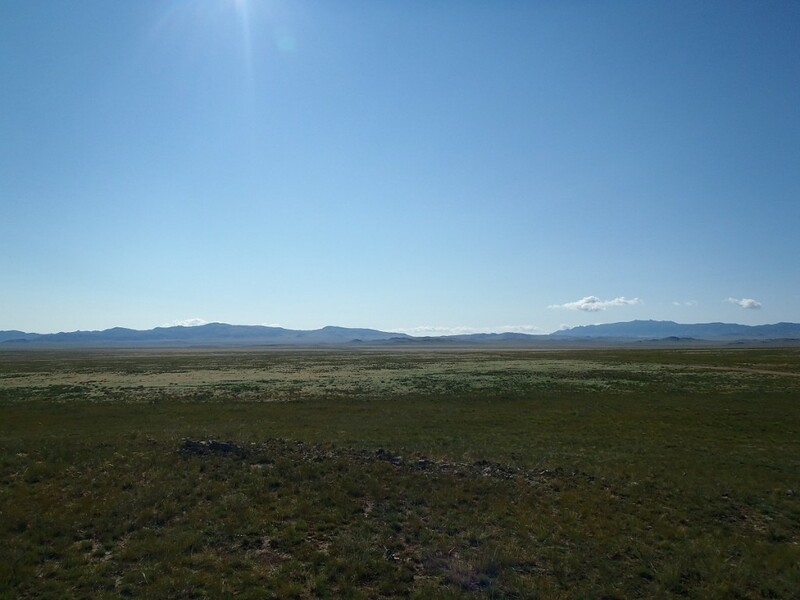 This was to turn out to be the quickest Mongolian/Russian border crossing ever only 45 minutes which included the most bizarre 25km run across no mans land. As we went through each check the staff were leaving behind us, what a result as we got back on the road in record time. 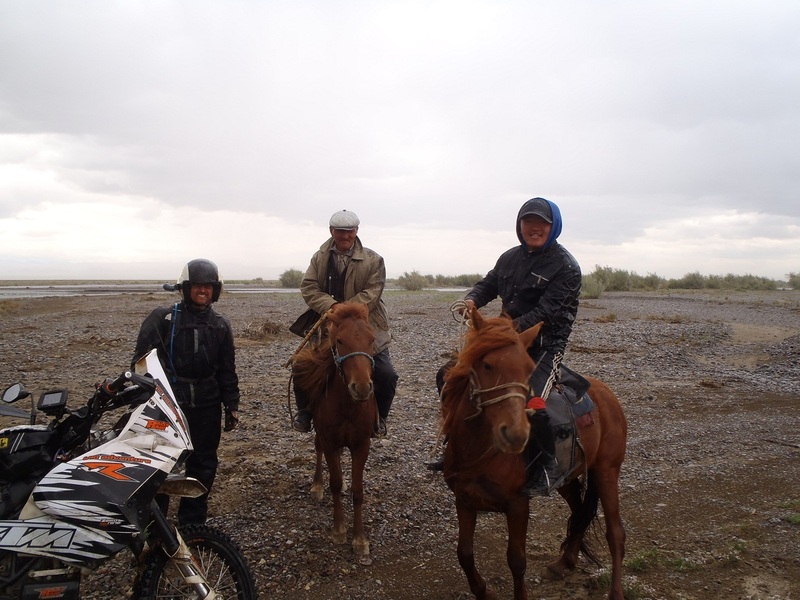 We rode for another hour or so until we arrived at Kosh Agach, time was getting on so we rode around the town and found a B&B for the night. 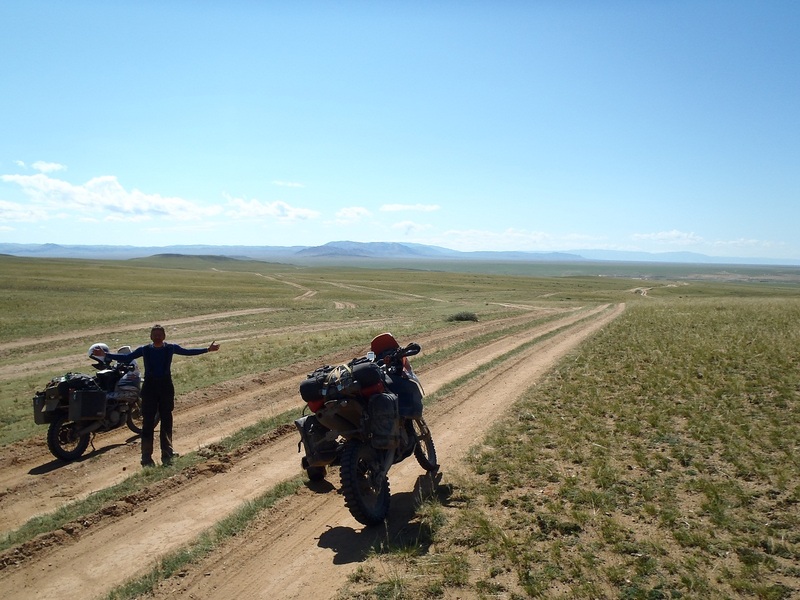 We broke camp this morning and started heading towards Ulaangom through the Mongolian wilderness, fantastic country side here but no roads only dirt, gravel or sand tracks but a lovely ride none the less. 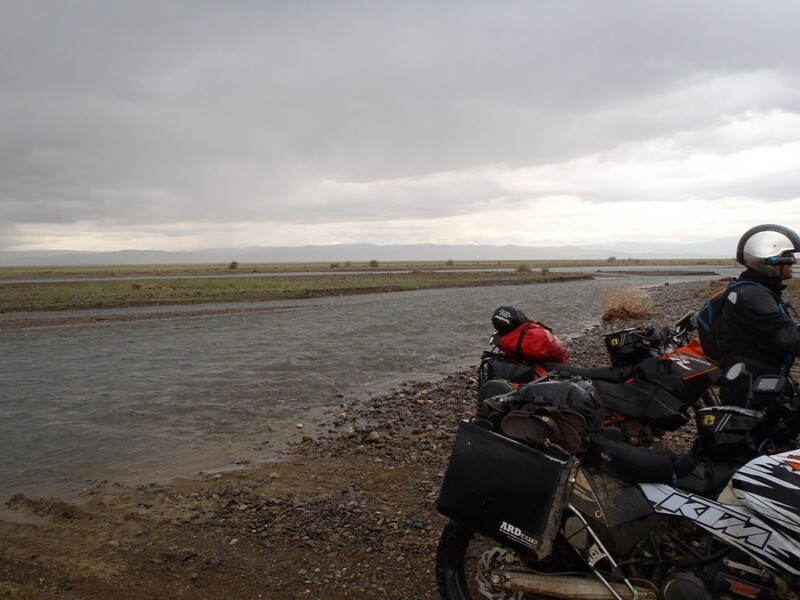 We arrived at a river crossing (our first in Mongolia! 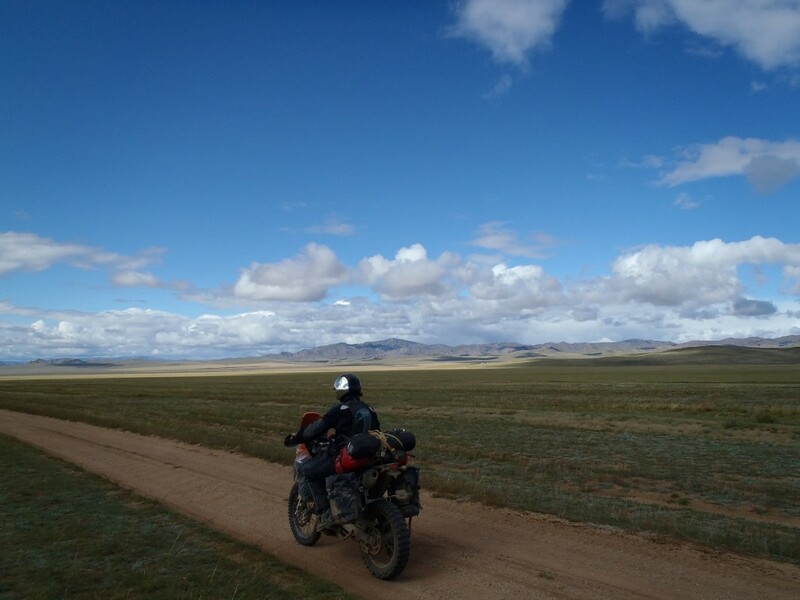 )in the absolute middle of nowhere at least 60km for the nearest town in any direction, Kev rode up the bank looking for a shallow place to cross when he spotted 3 guys with push bikes on the other side. 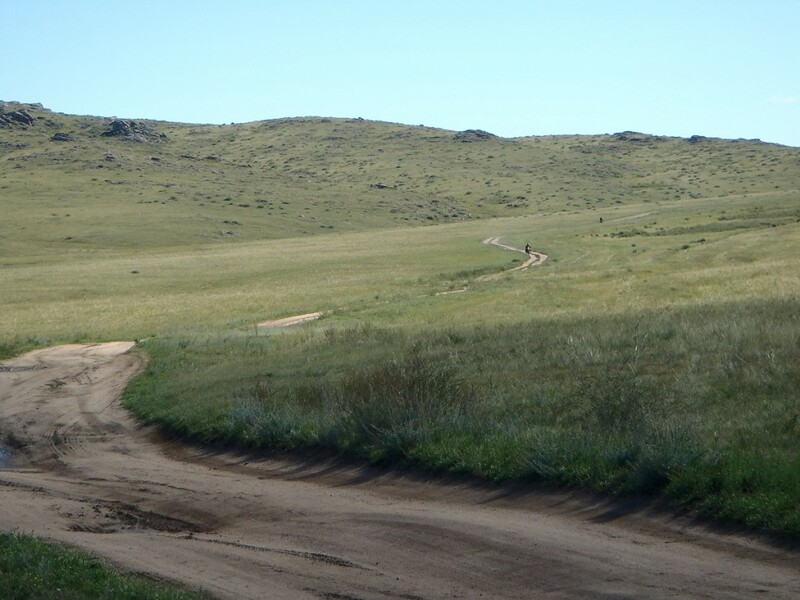 He shouted across asking where a good place to cross was, they wave an pointed to a point near them. 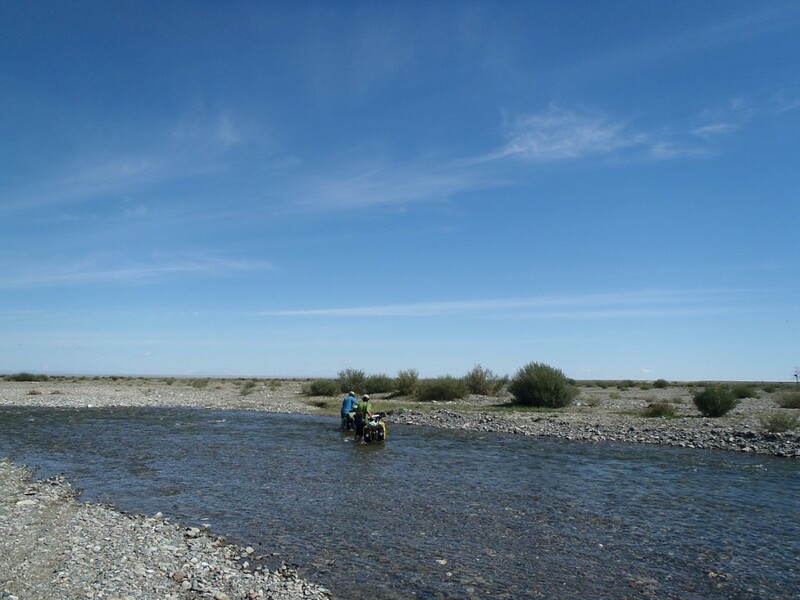 We rode along and off the bank into the river, which was a bit deeper than we were expecting, we made it through with the only casualty being wet trousers and boots for the rest of the day. They hadn’t heard Kev and were just pointing to where they had crossed. Early morning at 3rd campsite in Mongolia. So we introduced ourselves and they turned out to be 2 French guys been traveling for the last 2 months on their bikes and an Aussie (Benji) who has been travelling for 6 years on an around the world every country bike ride! (nuts or what). Benji offered us tea so we sat for an hour listening to some of the crazy stuff he has done so far. 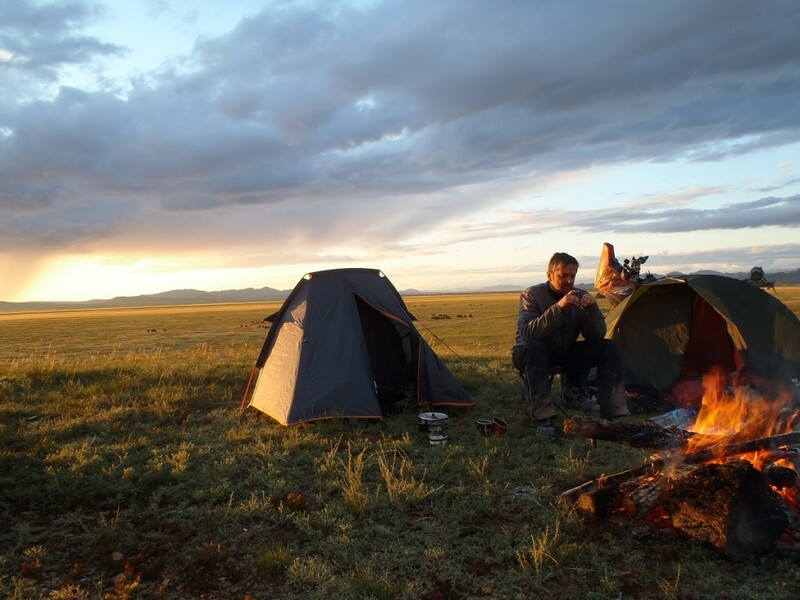 He had crossed a frozen sea which took him 4 days camping along the way and he had just crossed the Gobi desert. 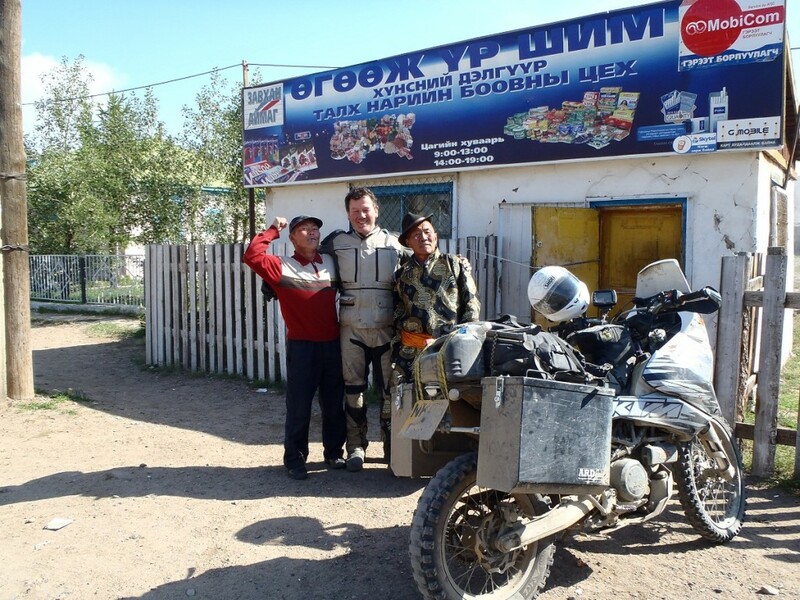 Back on the road and next stop was a small town/village where we stopped for some snacks and a fuel top up. As the guy started to fill our bikes we noticed that a woman was hand pumping the fuel from the pump! Funny how the man was just standing there with the nozzle and the woman was doing the hard work 🙂 . I guess it doesn’t matter where you go in the world, it’s always the same! 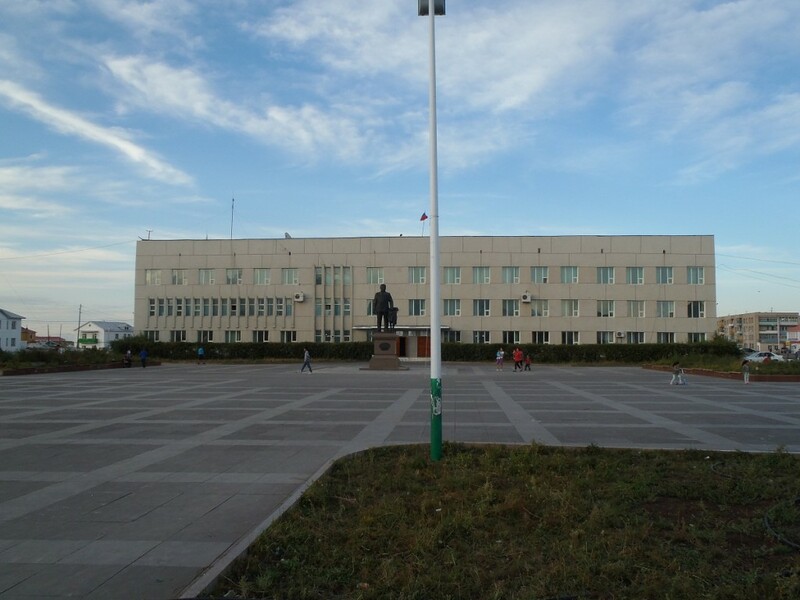 Eventually arrived at Ulaangom and found a fairly decent hotel for the night. 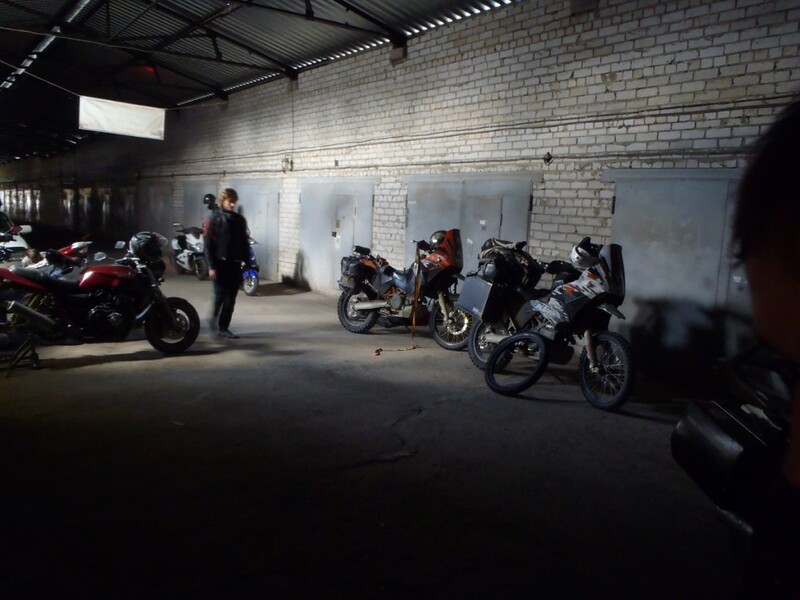 After we had locked the bikes away in a secured garage and showered up we were out for a Friday night beer. 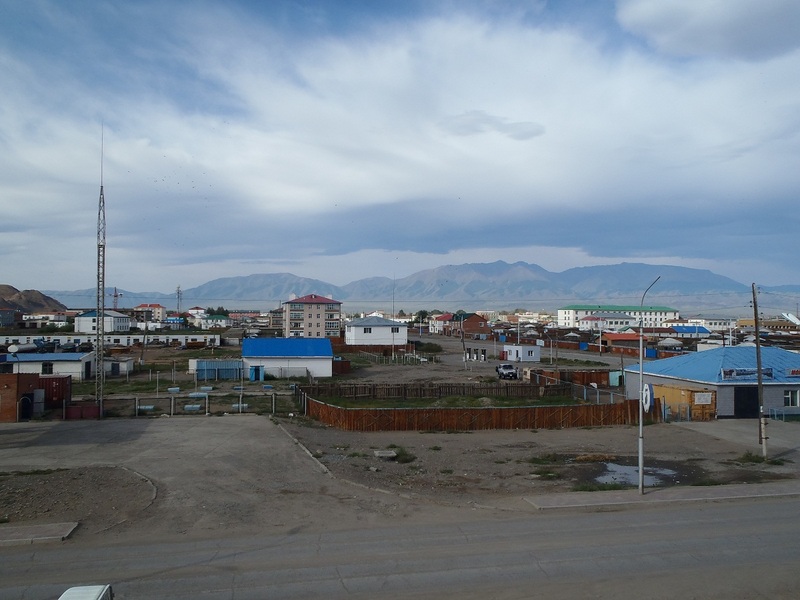 Unfortunately Ulaangom isn’t exactly a kicking place and after a couple of pubs and one Karaoke bar (seems to be very popular in Mongolia) we called it a night. 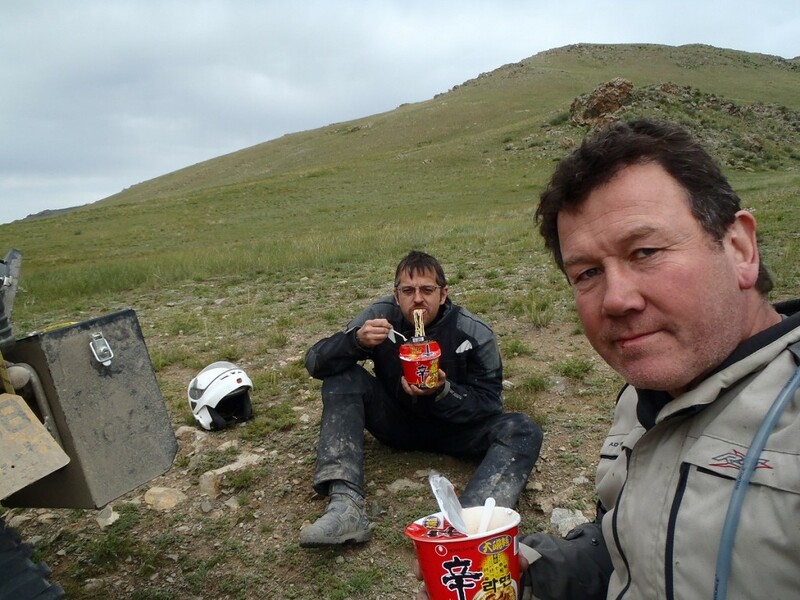 We woke this morning and had a lovely breakfast of pasta in creamy sauce (the last of our ration packs 🙁 ), while we were eating a herd of wild hoses appeared on the other bank of the river so we sat and drank tea watching them for a while before breaking camp and heading off. 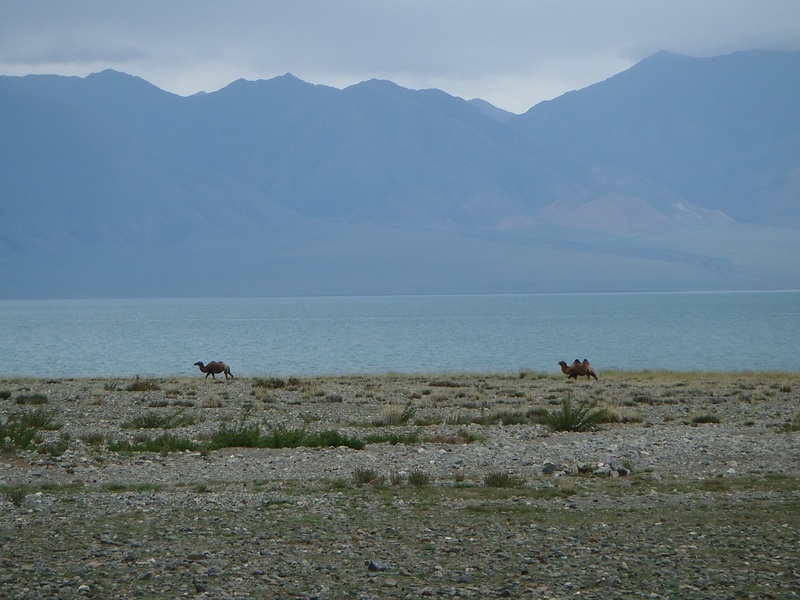 Wild horses at 2nd Mongolian campsite. Kev mixing with the locals. 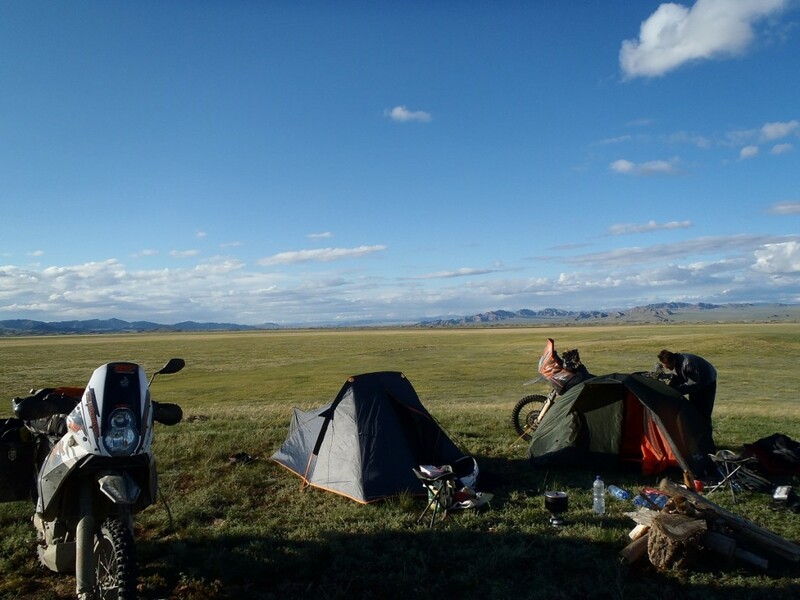 After a day of fantastic riding we decided to find a site to camp, there was this small mound in the middle of a massive plain surrounded by mountains. 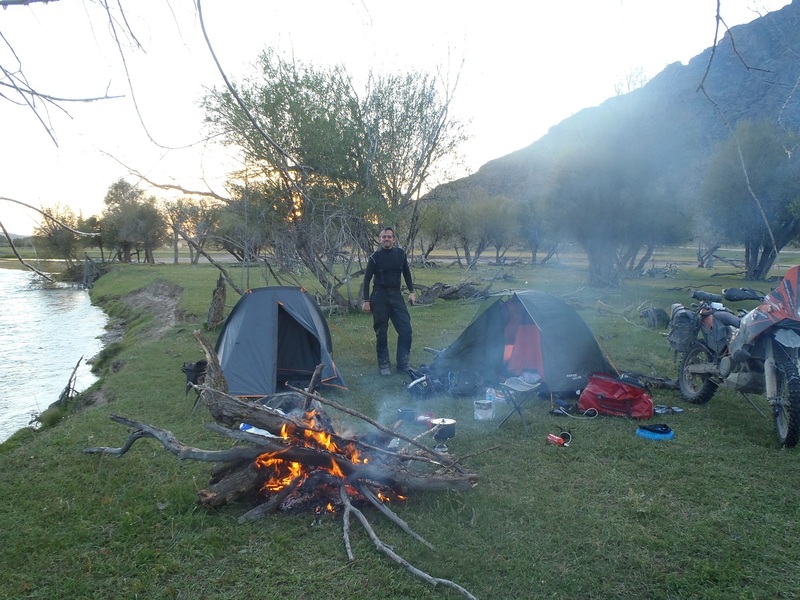 What a beautiful setting to spend the night, luckily there was some old fence wood laying around to make a camp fire as there are not many trees in this place! Up early today and out for a quick look around and up to the monastery on the hill, weather was lovely warm and sunny. 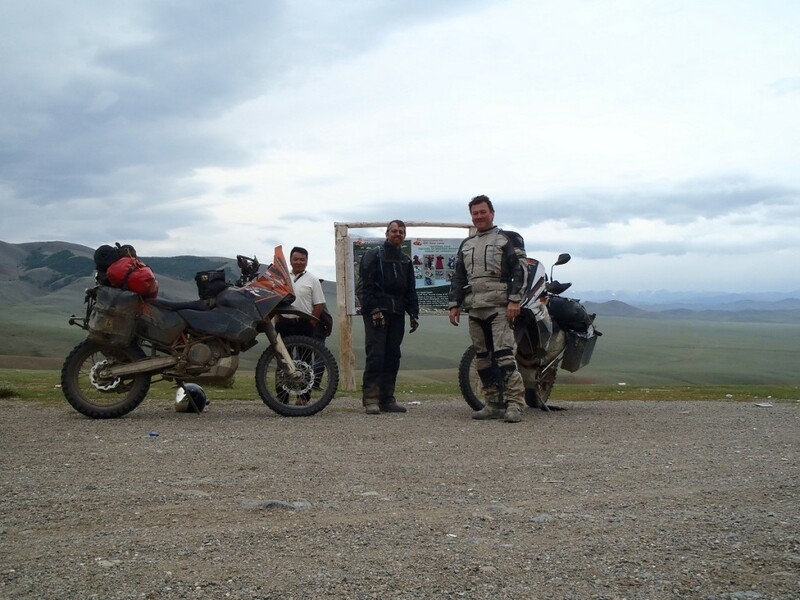 We decided to head west then take the northern route up towards Ulaangom. About lunchtime we stopped at a row of shops to get some noodles, chocolate, etc and decided to see if we could get a cup of tea 🙂 . Towards the end of the day my bikes front tyre punctured just as we entered a village/town for some fuel, so out with the slime pump to get it up enough to ride away from the gathering heard of locals. 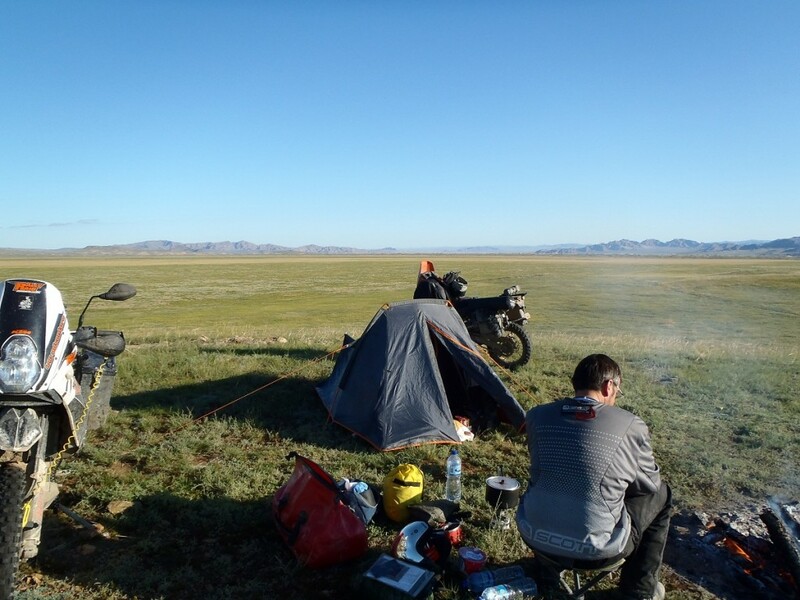 After about 10 more stops to put more air in, Kev had rode on and found a fantastic camping spot just out of the view of the road next to a large river behind some trees. I decided to let Kev change my tyre as he needed the practice 🙂 . To be fair he did a good job and it only took him about 15 mins. 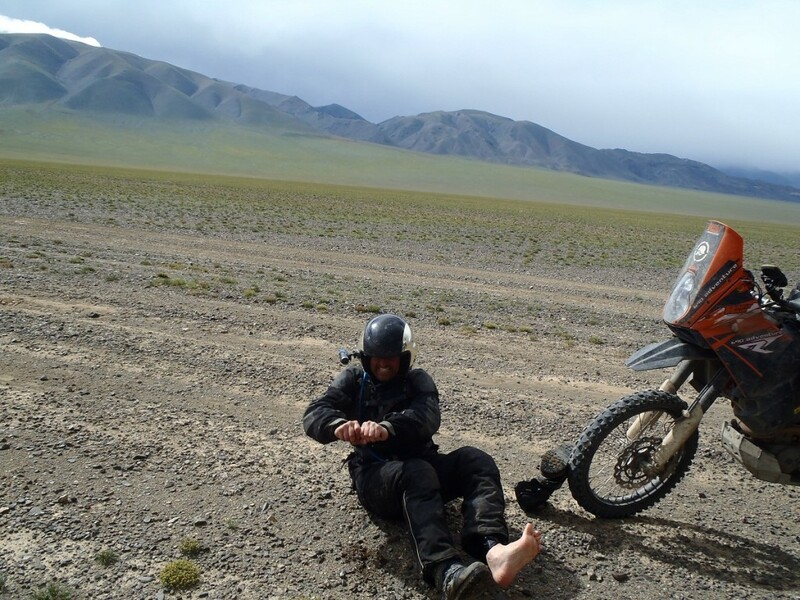 This was the first puncture of the trip and I think it wouldn’t have happened, my front was running the standard tube as when we rode to St Petersburg in June to drop the bikes off to the courier I had the front tyre changed to the Michelin Desert at a KTM shop in Germany. I had given them the 4mm tube to replace the standard but they didn’t do it, somehow what I asked for was lost in the translation.